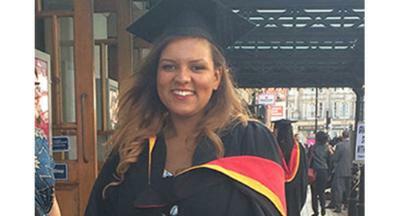 Melissa Hall, who studies Broadcasting and Journalism at the University of Wolverhampton, has graduated with ‘first class honours’ in her Bachelor of Arts Degree. The 23 year old, pulled out of university after discovering she was pregnant with her daughter during the second year of her studies. Even though she was over the moon with the news, the aspiring journalist knew this meant she had to post-pone university for another year. Melissa states there was not a doubt in her mind that she would not return to university as she had always wanted to persue a career in Journalism. The dedicated student returned back to the University of Wolverhampton to retake her second year, whereby she passed her foundation degree and continued to complete her third and final year. Melissa, from Walsall, graduated on September 10 with a ‘first class honours’ BA (Hons) degree in Broadcasting and Journalism, after receiving five A’s in her final results. Dorothy Hobson, Senior Lecturer in Media, Cultural and Communication Studies said: “I am so delighted that Melissa has achieved a first for her degree. “She worked well in her individual assignments aswell as her group projects. “I know how much effort she must have had to put in to her studies whilst caring for her family. Throughout her final studies, Melissa battled with judgemental individuals, assignment deadlines and exam revision all the time assuring her daughter was her number one priority; which often led to university assignments being studied through the night. With a family in full employment, she also struggled when it came to childcare during the days she had to attend university lectures. The University advised Melissa on a range of available support, which made a helpful contribution to childcare finances. Melissa says: “I’ve always wanted a career in Journalism, and now with my degree I can start living that dream whilst being a good mother and hopefully making her proud, giving her the ambition to achieve her dreams when she’s older. “I would encourage any parent out there to go to university and achieve their dream. Don’t get me wrong, it has been a struggle balancing childcare and my studies - but it was definitely worth it. With a passion for writing, the successful student hopes to achieve a career writing for a lifestyle magazine one day.